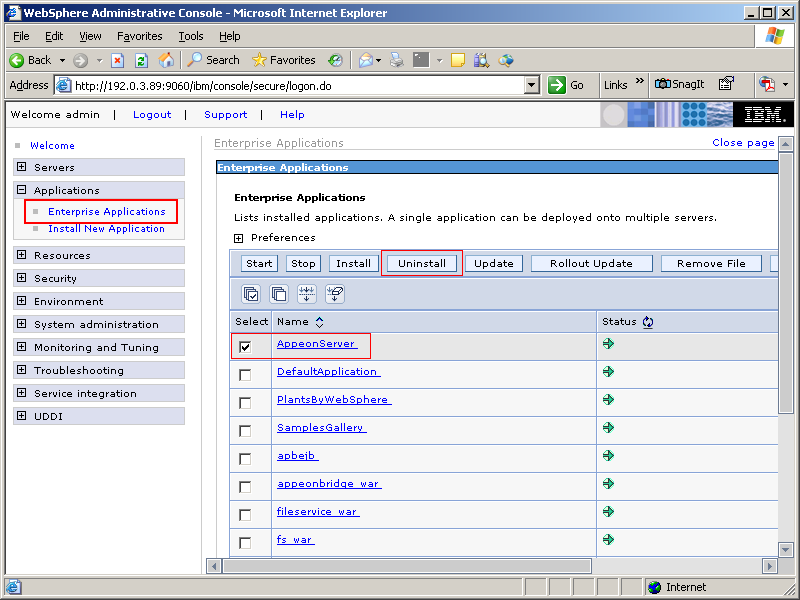 Step 1: Undeploy the AppeonServer application from the WebSphere Application Server Console. Step 2: Stop all running programs including PowerServer and WebSphere Application Server. Step 3: Run the apbuninstall.sh file in the _uninst folder under the PowerServer Mobile/Web installation directory, for example, /opt/IBM/WebSphere/AppServer/appeon/_uninst or /opt/IBM/WebSphere/AppServerCommunityEdition/appeon/_uninst. Step 4: Input y and press Enter to confirm the removal of PowerServer. Step 5: After the uninstall process is complete, remove any files or folders left in the PowerServer Mobile/Web installation folder.